Keeping your cymbals clean doesn’t have to be a chore. Proper handling of your cymbals and occasional cleaning will keep them clean. For the best and safest cleaning, ‘The SABIAN Cymbal Cleaner’ (a new, one-for-all formula introduced in 2001) is suitable for cleaning all cymbals – all series, all finishes… all brands. Avoid fingerprints by holding cymbals by their edges (try using the palms of your hands) or by wearing gloves (inexpensive cotton work gloves are good). The biggest enemies of clean cymbals are fingerprints and (if you’re a hard player) perspiration, so wipe these off immediately after every performance with a dry cloth (especially important with Brilliant Finish). Some nylon tips and colored sticks leave marks that are more difficult to remove than those of natural wood sticks. If you are concerned about keeping the logos on your cymbals, simply clean around them. We use environmentally friendly, mineral-based inks and they will eventually wear off if you wipe them with any cleaner. 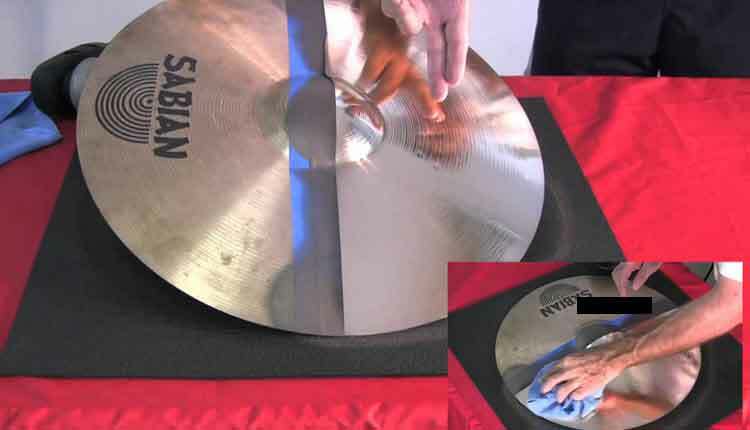 We recommend ‘SABIAN Cymbal Cleaner’. DO NOT use abrasive or acidic cleaners or scouring pads on any cymbal.